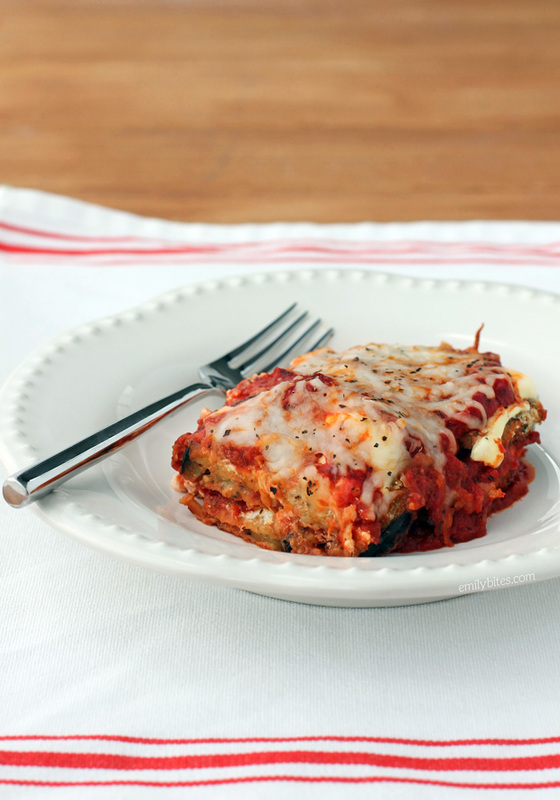 This cheesy, saucy Eggplant Parmesan Casserole is my kind of comfort food. The sauce is fresh and tomato-y, the sour cream/cream cheese layers are creamy and tangy and indulgent, the breaded eggplant slices are tasty and “meaty” and the overall effect is warm, cheesy and delicious. It’s also one of those vegetarian meals that’s hearty enough that you’ll never miss the meat! The recipe has a few steps, but the initial baking of the eggplant slices can be done at the same time as you make the tomato sauce and mix the sour cream and cream cheese together, so I promise it doesn’t take as long as it looks. I served this with a side salad and I was stuffed afterwards – a great “bargain” at just 257 calories or 7 Weight Watchers SmartPoints! If you’re looking for more Italian comfort food recipes, have a look at my Sausage Tortellini Skillet, Chicken Parmesan Quinoa Bake, Bubble Up Pizza Casserole, Spaghetti Pie, Slow Cooker Meatballs & Marinara, Four Cheese and Sausage Stuffed Shells and more in the Italian section of my recipe index! Pre-heat the oven to 375. Line 2 large baking sheets with aluminum foil or parchment paper and lightly mist with cooking spray. Beat the egg whites in a bowl with a whisk until well combined. In a shallow bowl or dish, combine the bread crumbs and grated Parmesan and mix together. Dip each slice of eggplant into the egg whites, coating all sides and then allow excess to drip off. Then dip the coated eggplant into the bread crumb mixture, coating all sides and transfer the breaded eggplant to the prepared baking sheet. Repeat for all eggplant slices. 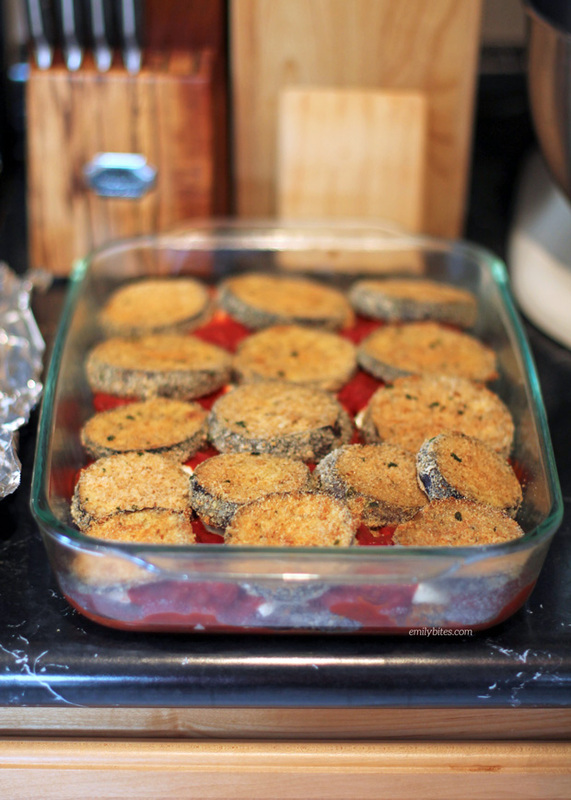 Spray the tops of the breaded eggplant slices with cooking spray and bake for 20 minutes. Flip the eggplant slices over, spray with cooking spray and return to the oven for another 15 minutes. While the eggplant is baking, bring the teaspoon of olive oil over medium heat in a medium saucepan. Add the chopped onion and stir to coat. Cook, stirring occasionally, for a few minutes until onions are softened. Add the minced garlic and cook for an additional minute. Add the crushed tomatoes, tomato sauce, tomato paste, basil, Italian seasoning, salt, sugar and the bay leaf to the onion mixture and reduce heat to low to simmer. Stir to combine and let simmer for 15 minutes or until eggplant is done from step 2. Remove the bay leaf before using the sauce in the casserole. When the breaded eggplant is done baking, lightly mist a 9×13 casserole dish with cooking spray. Spread about 2/3 cup of the sauce across the bottom of the dish and place a single layer of the eggplant rounds on top. Drop spoonfuls of the sour cream mixture (using about half) across the eggplant layer and spread with the back of a spoon. Spread about a cup of the tomato sauce over the top of the sour cream mixture and follow it with a layer of the remaining eggplant rounds. Follow with another layer of sour cream mixture (use the rest) and another sauce layer (use all remaining sauce). Top with the shredded mozzarella and bake in the oven for 20 minutes until heated through and cheeses are melted. You are a girl after my own heart. I love eggplant parm. This looks devine! This looks amazing. Do you think I could sub ricotta for the sour cream/cream cheese mixture? This looks good…i have yet to make anything eggplant and this receipt is a great start. This came out great! I actually loved how just baking the eggplant in the egg white/parm/Italian breadcrumbs tasted! I had extra and sliced them up like “fries” and dipped them in the sauce. So crispy and satisfying! This was delicious and a huge hit at my house! Love the vegetarian recipes! HOW MANY SERVING IS THIS FOR 7 PP?? I have to say I was a skeptic when I read this recipe. Both my husband and I are Italian and were taught to make eggplant by our grandmothers, fried in oil. I have never liked baked eggplant but this was delicious even my husband loved it. Thank you for this great recipe. I will never fry eggplant again. This was very good! I cheated a little bit and used the Trader Joes marinara sauce instead of making the sauce . The result was delicious and very filling! Totally worth the time! A few years ago, I made your Spicy Sausage/Eggplant Spaghetti Bake and learned that roasting eggplant solves the texture problem I’d never been able to get past. This recipe is just as good if not better. I made it this week, and my husband and I both loved it. You really don’t miss the fat from frying at all. A fantastic vegetarian option to add to my rotation. Thanks! I made this last weekend and it was really delicious. Even my picky eater ate her entire portion. The leftovers were great, too. I will definitely make this again. I think I will consider trying it with ricotta next time. Thanks, Emily! Trying to figure out how I can get by making this in an 8 x 8 dish. I have all ingredients on hand but only have one eggplant and I’d like to avoid the grocery store today! Do you think if I just cut all the ingredients by half, that would work? I think you can definitely halve the recipe, let me know how it turns out! Emily, I am sorry but this was not worth the effort. It takes a long time to make and uses a lot of dishes. It did not taste as I expected and was very disappointing. It made an awful lot also. I’m so sorry to hear that, especially since I’ve received so much positive feedback on this recipe from other readers who have tried it! It must just not be to your tastes. I hope you love the next recipe! Good morning Emily. Can you tell me if this can be assembled a day ahead and baked the next day? Will it cause the eggplant to go soggy? I haven’t done that with this dish but I think it would be fine. Let us know if you try it! This was delicious, Emily! I did take a shortcut by using our favorite jarred sauce. My 4 year old daughter absolutely loved helping coat the eggplant slices! Thanks for another winner. Very easy and delicious meals..thanks for sharing!! Made this tonight – I think the 1/2 slices were still too think – some of the eggplant was still hard, and I even baked it an extra 10 minutes. I’d suggest thinner slices, or baking even longer, unless you like it on the hard side. I also thought the cheese taste was WAY overpowering – wasn’t crazy about the sour cream and cream cheese taste in it.I’d probably prefer ricotta in it and would part skim next time. Also, there was just too much sauce – it was swimming in sauce – I think you could get away with using half the amount of sauce and it would still be good. 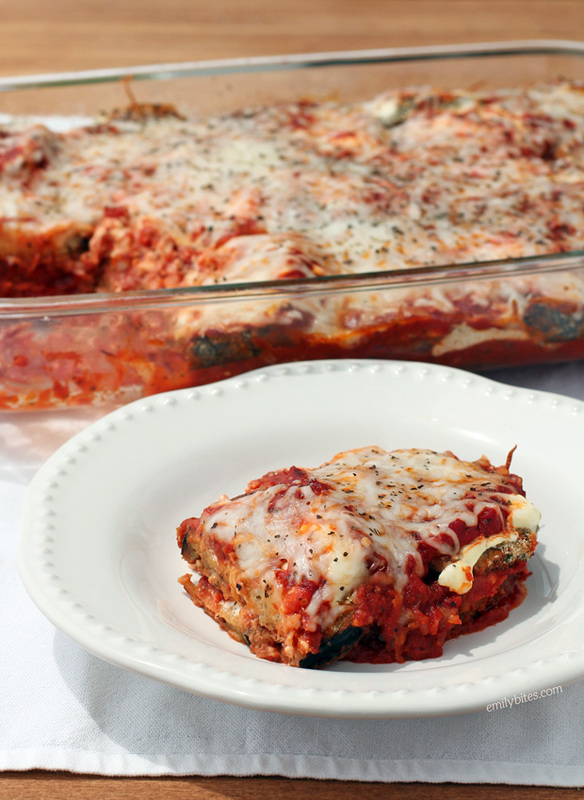 My husband is a huge eggplant parm fan – he agreed with most of this too. I don’t usually like eggplant but I did like this because the eggplant was crispy and not soggy (which is how it gets when you fry it in oil). So I’d make it again, but with these modifications! This was absolutely delicious!!! My whole family enjoyed it. Everyone went back for seconds! This dish was so good and I felt like it was way more than 7 points it was so rich in taste and flavor. I paired it with some parmesean roasted cauliflower. I literally scraped my plate clean. So good! Have to say, this one was not a hit at our house. Hubby said all he could taste was the cream cheese, and no one really enjoyed it. Love lots of your other recipes though! Just want to post that I made this last night and my whole family loved it! Even my husband that doesn’t like eggplant. I loved that the eggplant stayed somewhat crispy and that it is lower in calories. What is the serving size, please. Hi Beverly, this recipe makes 8 serving so you just cut the casserole in 8 equal pieces and serve! I made this tonight, but with zucchini. The eggplants at my grocery store were looking pretty sad, but they had some giant zucchini. It was awesome! Reminds me of ‘million dollar spaghetti’ which is so bad, but so good. I definitely want to try it with eggplant next time! I’m so glad it was a hit with the zucchini! I’ll have to try that. This is one of our favorite recipes!! We had a bunch of eggplant in the garden so I made two….was thinking of freezing one. Have you ever tried to freeze them? My family loved this. I added itlain seasingbto the cream cheese mixture and it was delicious. I also used Panko instead of Italian bread crumbs.